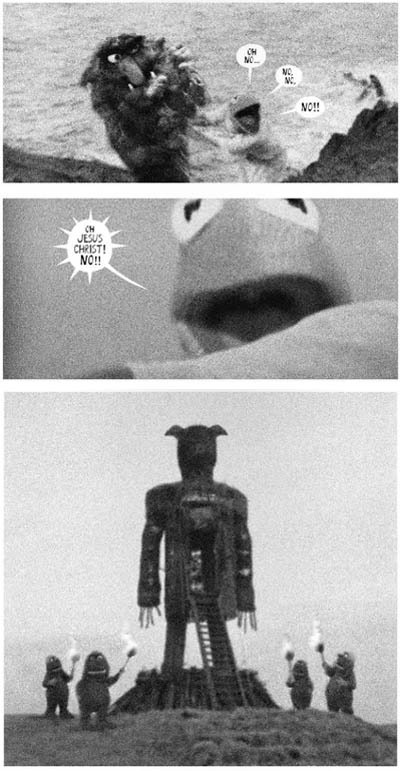 That’s the video preview for a full-length comic book mashup of The Muppet Show and The Wicker Man by Paul O’Connell. Well, words seem to be failing at the moment. i’m giddy with a palpable mixture of excitement and dread. I’ll not forget that happy night among the rigs with piggy! Truly appears to be a labor of love. And, of course, the product of a disturbed mind. Jim Henson is clearly not dead. But really I’m sick of these mash ups. All of them. Each and every one. What these are, even the good ones, are just dreck. The work has already been done by real artists then someone comes along and rearranges it all. Its leeching.